Pay Attention to Ergonomics | Christina Angelos, D.C. Decrease your risk for injuries, be more productive, take less sick days and feel better at work…all by simply paying more attention to your workplace ergonomics. 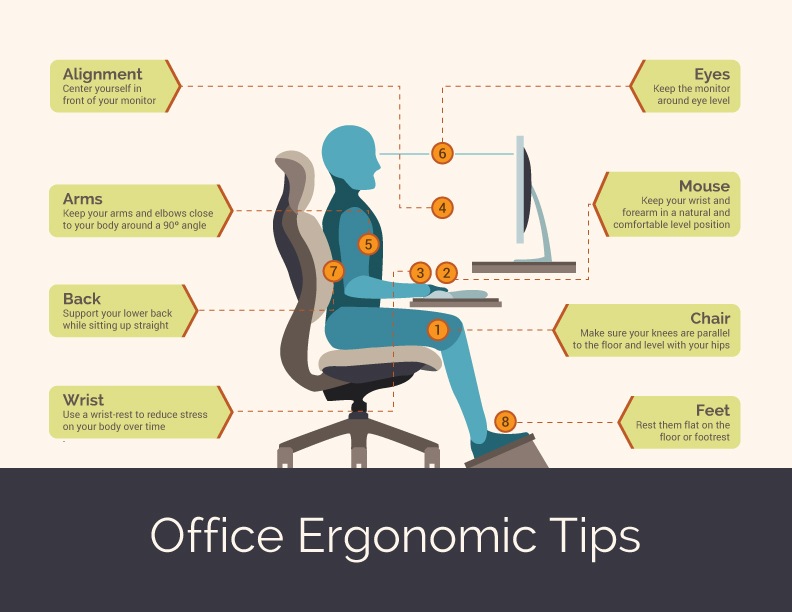 Proper ergonomics is very important for your overall health and we’re here to help. Bend over properly, using your legs to bend as opposed to your back. Get up, change position, move around and stretch every hour for at least a few minutes. Consider having a seated workstation that converts into a standing workstation. If you work in an office with a group of people, it may be wise to hire an ergonomics specialist, who will visit your office and help set up workstations for success. Employers should ask their workers’ compensation insurance carrier if they offer discounts on their insurance rate for offering employee benefits such as ergonomic consultations and back care classes. Set up your workplace correctly and take recommended breaks to stretch and relieve stress on your body. Together as a unit, you can encourage each other to work smarter!